We present a case of CMN which was treated with curettage and electrocautery in the initial session followed by a combination of Q-switched neodymium-doped yttrium aluminum garnet (Nd: YAG) and carbon dioxide (CO 2 ) laser along with curettage. A 2-week-old male neonate of full-term normal vaginal delivery presented with CMN [Figure 1]. The nevus was present over the face involving lower forehead, the eyelids, nose, and both cheeks. On examination, the neonate was clinically normal. Under general anesthesia, we performed electrocautery and surgical curettage over the entire lesion except the eyelids in order to prevent trivial injuries to the eye. The wound was dressed with non-adherent antibiotic tulle (Sofra-tulle) and thisdressingwas removed after 48 h. The raw area showed crusting with ulceration which gradually healed with almost 60-70% clearance of the nevus [Figure 2]. Six months later, the infant presented with residual lesion over the cheeks and nose and fine hairs over the cheek areas. The treatment was planned to performboth Q-switched Nd: YAG and CO 2 lasers. 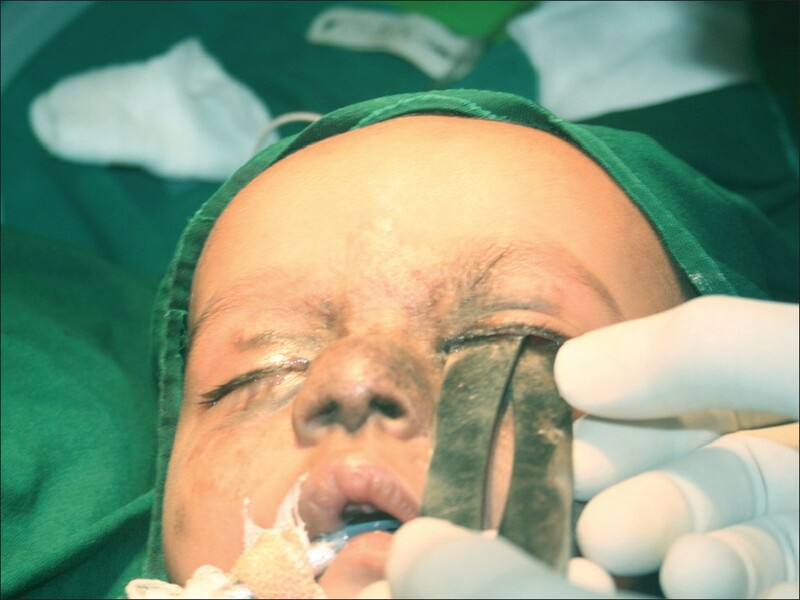 Once again under general anesthesia with the help of an ophthalmologist to safeguard the eyeballs, a metallic flat shield was placed by lifting the upper eyelid since ophthalmic guard was not available [Figure 3]. The face of the infant was thoroughly wrapped with wet drapes during the procedure. The affected area was treated with Q-switched Nd: YAG laser (Medlite C6, Conbio Aesthetic Lasers, Freemont, USA) using the following settings: 1064 wavelength, 2J/cm 2 fluence, 6 mm spot size, and repetition rate of 5. The settings of CO 2 laser (Acupulse, Lumenis Ltd, Yokneam, Israel) under super pulse mode were fluence of 15J, spot size of 2 mm, and depth of 1 mm. During this treatment, the lesions over the eyelids weretreated with both lasers in addition to the residual lesions over cheek and nose. CO 2 laser ablation was used by defocusing the beam to cause superficial damage. The post-operative period was uneventful with normal vision. Following this procedure, the lesion cleared upto 85-90% with minimal to no scarring [Figure 4]. The management of CMN becomes mandatory for two reasons: One to reduce risk of malignant transformation especially in larger variants and second to enhance cosmesis. Surgical excision of CMN depends on the size and site of the lesion. The larger lesions that require surgical excision are usually followed bytissue expanders, tissue grafts, and tissue flaps in order to repairthe large defects. Surgical curettage is relatively an alternate simpler procedure whenperformed during the neonatal period yields acceptable results. The line of cleavage during neonatal stage is remarkably separable at the level of dermo-epidermal junction. The rationale of combining laser was to augment ablation using CO 2 laser and Q-switched Nd: YAGlaser was to target both superficial and deep pigmentations. Margulis et al. successfully treated 44 patients of CMN involving the eyelids and periorbital region at the age of 6 months and above with excision and reconstruction. They also highlighted the significance of early intervention at neonatal period to avoid complicated procedures. The lasers reported for CMN are high-energy pulsed CO 2 laser, erbium: YAG laser, normal-mode ruby laser, Q-switched Nd: YAG laser, Q-switched ruby laser, and Q-switched alexandrite laser with varying outcomes. ,,,, The long-term recurrences with laser treatments cannot be excluded as a result oflack of penetration to deeper tissue levels. The treatment of CMN, once established, becomes difficult and requires complicated surgical techniques. When the lesions are very large, such techniques cannot be used to remove the entire lesion. 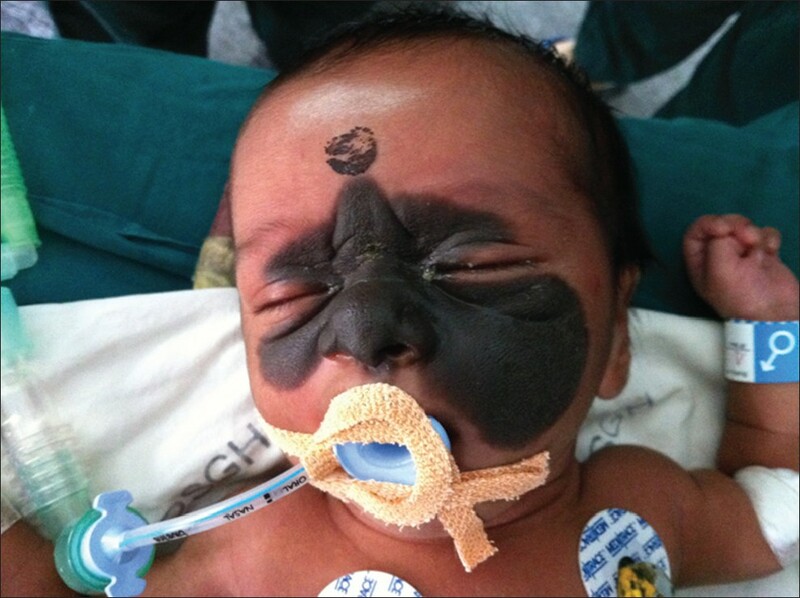 Since the lesion is superficial during the neonatal stage, the lesions are more amenable to simpler surgical techniques such as electrocautery, CO 2 laser ablation, and curettage. Early referral of such cases can lead to improved quality of life for the child. 1. Price HN, Schaffer JV. 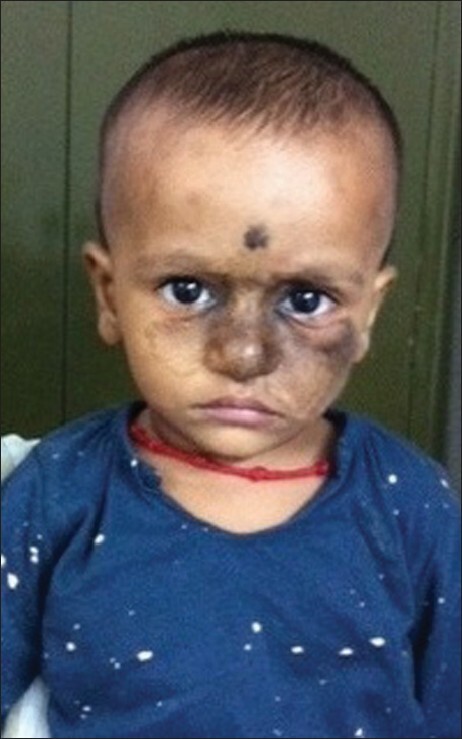 Congenital melanocytic nevi-when to worry and how to treat: Facts and controversies. Clin Dermatol 2010;28:293-302. 2. Mark GJ, Mihm MC, Liteplo MG, Reed RJ, Clark WH. Congenital melanocytic nevi of the small and garment type. Clinical, histologic, and ultrastructural studies. Hum Pathol 1973;4:395-418. 3. Rhodes AR, Silverman RA, Harrist TJ, Melski JW. A histologic comparison of congenital and acquired nevomelanocytic nevi. Arch Dermatol 1985;121:1266-73. 4. Everett MA. Histopathology of congenital pigmented nevi. Am J Dermatopathol 1989;11:11-2. 5. De Raeve LE, Roseeuw DI. Curettage of giant congenital melanocytic nevi in neonates: A decade later. Arch Dermatol 2002;138:943-7. 6. Margulis A, Adler N, Bauer BS. Congenital melanocytic nevi of the eyelids and periorbital region. Plast Reconstr Surg 2009;124:1273-83. 7. Michel JL. 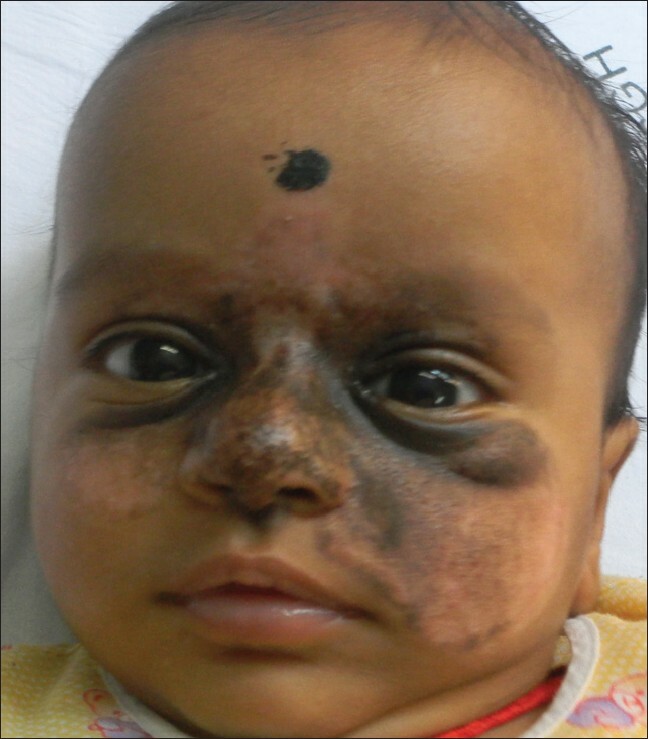 Laser therapy of giant congenital melanocytic nevi. Eur J Dermatol 2003;13:57-64. 8. Reynolds N, Kenealy J, Mercer N. Carbon dioxide laser dermabrasion for giant congenital melanocytic nevi. Plast Reconstr Surg 2003;111:2209-14. 9. Chong SJ, Jeong E, Park HJ, Lee JY, Cho BK. Treatment of congenital nevomelanocytic nevi with the CO 2 and Q-switched alexandrite lasers. Dermatol Surg 2005;31:518-21. 10. Lapière K, Ostertag J, Van De Kar T, Krekels G. A neonate with a giant congenital naevus: New treatment option with the erbium: YAG laser. Br J Plast Surg 2002;55:440-2. 11. Kono T, Erçöçen AR, Chan HH, Kikuchi Y, Nozaki M. Effectiveness of the normal-mode ruby laser and the combined (normal-mode plus Q-switched) ruby laser in the treatment of congenital melanocytic nevi: A comparative study. Ann Plast Surg 2002;49:476-85.